I use the following filters in the order listed to improve my scans of Matte Images:Noise Dust & Scratches: Radius: 3, Pixels, Threshold: 12 Pixels Reduce noise: Strength: 8, Preserve Details: 60%, Reduce Color Noise: 45%Median Filter Radius: 3 PixelsMedian Filter Radius: 3 PixelsGaussian Blur Radius: 2 PixelsFortunately, most of the photos were taken with a low quality camera, and I scan them at 1200 Pixels/in. Consequently, while these settings blur the image slightly, the overall image quality is much better. In the attached image, the right end is 'as scanned' from the 'white' edge of a photograph. The two grayscale images were created by using the : Enhance-->Auto levels. The filter sequence above was applied to generate the center panel. These were then converted to black and white to exaggerate and emphasize the Matte matrix. InI fully believe that due to the periodic nature of the matte finishes, a matte removal filter could be designed. Note: This is only one of several matte patterns that I have seen. There is no perfect way to clean up the matte texture. An FFT filter would be closest, but you would still limit the cleanup to the matte area and not apply it to the entire image. I agree, especially since the texture can be hidden by the photograph itself and by photo damage. My thought on fairly simple filter would be to use a 2-D Fourier transform filter to extract the matte pattern. Even better would be to follow up with a deconvolution to improve the image using the extracted mask. 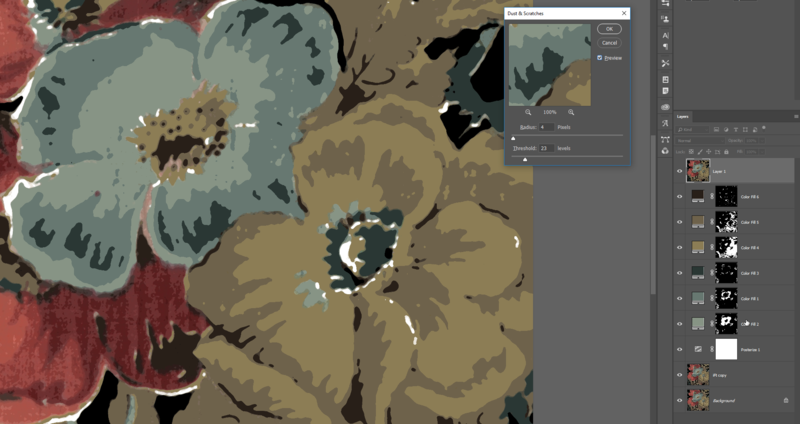 If we could get images of all of the possible matte patterns, the problem might be simplified. In the photos I have examined the two main patterns appear to equilateral parallelograms or equilateral hexagons, both of which will 'close' pack. The FFT filters/actions at http://ft.rognemedia.no works wonders for this. Just updated it with improved semi-automatic removal, and support for color images. It saves a lot of time compared to the old manual way and gives better results. Got tired of waiting for Adobe to implement this, so me and a guy in his mid seventies put it together ourselves (he fixed the plugins, I did the actions). Cleaning up these kind of patterns is what I have to spend a lot of time as well ... 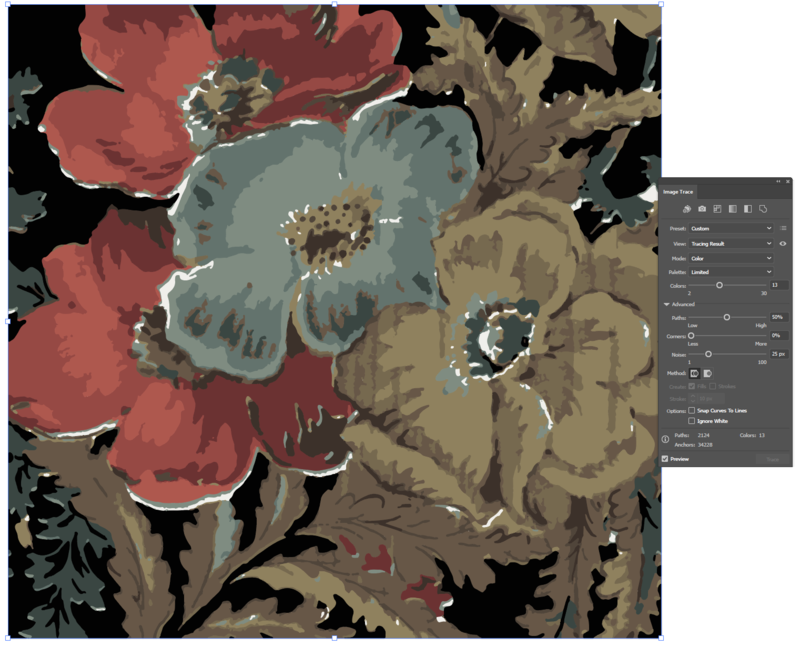 I scan in fabric patterns for textile and the ground texture is unvoidable. There is a balance between preventing the blurring/smearing and still trying to get rid of much texture as possible. Median, I find is too strong in most instances. Reduce noise is too subtle and similar to Dust and Scratches. I find radius of one is the best setting. Occasionally, depending on the type of print and desired result, some of the filters in filter gallery can work. Sometimes you may also be able to isolate by color and 'clean' some areas while ignoring others. Either way, it would be nice to have more control over it. The Deconvolution sounds like a great idea. Similar noise cleaning is done in audio by sampling a piece of noise and using it to nullify itself. I wanted to add an image example to better illustrate. It may be difficult to see on a jpeg. Currently there is no tool in Photoshop that aids in doing this. It is literally weeks/month of work (for ref this is a 30 by 30 inch image), but I am supposed to complete these things in days. So, I am not kidding you. I will have to hand draw this entire thing. I do have 3rd party software that I use to separate and clean further, but that's useless at this stage as it will only pick up the dirt from the original file. I am trying to find a compromise, I obviously understand that this will not be perfect and require some manual labor. If anyone has any tips to deal with scenarios like this, or more suggestions on features that could be added, that would be absolutely huge. I would owe you. Fourier transformation and pattern suppression won't really do a good job here, but it could help suppress the fabric texture slightly (where it's flat and even), so it's worth to try and run it through the process before you do anything else. It only takes a couple of minutes (once you know how) so worth testing. I'd try some Median + Surface Blur and see if I could get it evened out a bit. Be careful as it will murder details. Dust & Scratches can be useful for getting rid of single pixels that stand out. 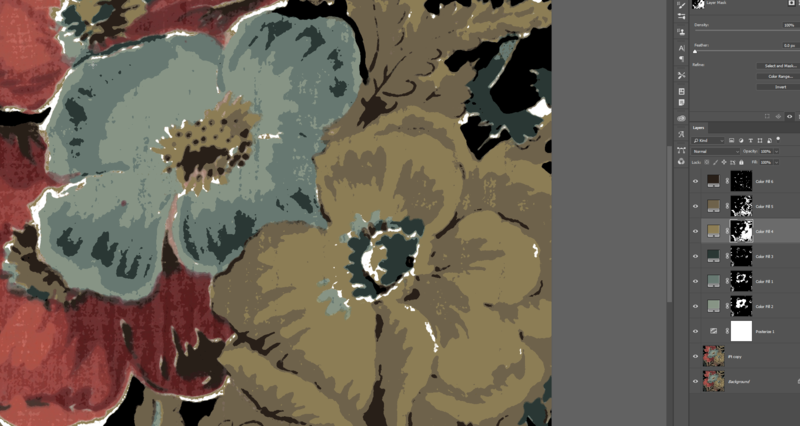 The black and white you had already started with messed it up a bit, but I did the blue and brown flowers (three shades of each) and it's not great: https://i.imgur.com/EXpOW60.png (and with dust & scratches).